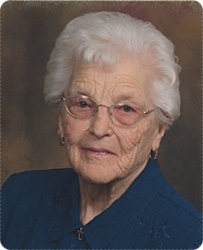 Hilda Hope (Griffen) Rozema, age 99, of Grand Rapids, entered into the arms of Jesus on Saturday, November 3, 2018. Hilda was a prayer warrior and worked and volunteered at Bibles for Missions for many years. She was preceded in death by her husband, John. Hilda will be lovingly remembered by her children, Jerry (Ginny) Rozema, Roger (Chris) Rozema, Michelle (Jim) Krul; 12 grand-children; 22 great grandchildren; seven great-great grandchildren; sisters-in-law, Bonnie Griffen, Helen (Herm) Scholten; and many nieces and nephews. The family will greet visitors on Tuesday from 2 - 4 and 6 - 8 pm at Stroo Funeral Home (1095 68th St. SE) and Wednesday, November 7, from 10 - 11 am at Kelloggsville Christian Reformed Church, 610 52nd St. SE, where the funeral service will begin at 11 am with Rev. Martin Benckhuysen and grandson, Terry Rozema officiating. Interment will be in Pine Hill Cemetery. Memorial contributions may be made to Kelloggsville CRC Benevolence Fund or Legacy Christian Schools.